If you’re a modern parent who doesn’t want to buy the typical baby gear for that new addition to your family, then the 4Moms Mamaroo infant seat is perfect for you. Featuring a sleek design and nothing but comfort for your little one, it’s a quality selection that’s tough to beat. However, before you make the decision to get it, make sure it’s exactly what you’re looking for by checking out this in-depth product review. Out of all the infant seats on the market, this one has the most interesting features and benefits associated with it, something that makes it a pretty incredible buy for your child. A modern, sleek design with unique color schemes like classic grey, classic black, or green plush. Padded seat with the option to recline. Padding is removable and machine washable. Overhead mobile with toy balls adorned with fun shapes and patterns. Toy balls are removable. Has five motions, including kangaroo, car ride, tree swing, rock a bye, and ocean with five different speeds. Comes with five built-in sounds and is MP3 compatible. 5 lbs with a maximum holding weight of 25 lbs. Dimensions are 24 x 20 x 34 inches. Adding to the overall look of a space rather than take away from it thanks to the modern look of the infant seek. Being able to soothe your baby in a variety of ways with its many motions, speeds, reclining seat, and pleasant sounds. Having the ability to introduce your son or daughter to any type of music that you like courtesy of its MP3 compatibility. Easy to keep clean due to the fact that the seat padding is removable and machine washable. All the different ways a baby can be comforted and soothed. Durable thanks to its larger size and weight. The toys allow a child to develop his or her sensory and motor skills, providing your little one with something to not only look at, but also try to grab and touch as well. Since it’s so big, it’s hard to move. The set-up of the unit is a bit tricky and requires some time. It’s one of the pricier options on the market. 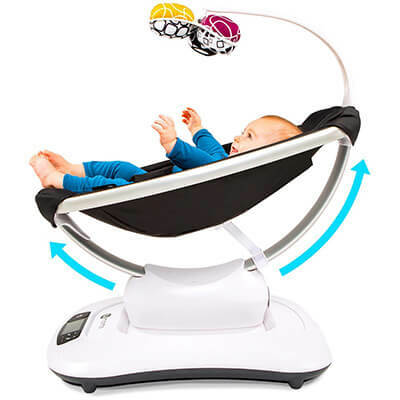 Most parents like the versatility of the Mamaroo baby seat, especially all of the motion options that kept their child from getting too used to any one of them. There were a lot of parents who didn’t like how awkward it was to move around and some said that the placement of the ac plug in was hard to get to. There were also a lot of parents who liked that the unit was MP3 compatible, which provided their child with something else to listen to besides the usual baby noises and sounds. One parent even remarked about how much they enjoyed just sitting and listen to classical music it was playing while watching his son sleep. Most parents thought the baby seat was worth the larger price tag but still remarked about how expensive it was. Look for what you want at different places to ensure you get it at a good price. Ignore the impulse to overspend and buy unnecessary items. Don’t be afraid to ask questions about what you’re buying to ensure it’s what you want. Customer service people are there to help, so, put them to work if you need to. When it comes down to it, the 4Moms Mamaroo is a quality baby bouncer option that is stylish, functional, and comfortable. Although it’s a little pricier than most other infant seats, it’s well worth it because of all the features and benefits that it has to offer. Basically, if you want the best of the best in relation to infant seats for your child, then the 4Moms Mamaroo is an ideal choice for you.